The earliest obtainable plan or map of New York City. Ville De Manathe ou Nouvelle-Yorc. A beautiful example of J. N. Bellin's important 1764 map of New York City. The map depicts what is today the Financial District at the southern tip of Manhattan between the Hudson River and the 'Canal de la Longue Isle' or east River. Bellin's plan of New York is taken directly from an inset attached to J. B. L. Franquelin's 1693 regional manuscript map. Cartographically most of the raw information upon which the map is based was likely drawn from the French pirate and ne're-do-well, John Reaux, who became a citizen of New York City in 1692. Prior to the 1763 defeat of the French forces in America at the end of the French and Indian War, the greatest threat to the strategically important but struggling colony of New York was potential invasion by the French. Were the French to successfully capture and hold New York, they would essentially control the vital Hudson River Corridor between New York and Montreal. Not only would control of the Hudson allow the French to dominate trade in the region, it would effectively divide the english colonies leading to strangulation and ultimately collapse. No one was more aware of this than the citizens of New York City and, of course, the French. A French naval invasion of New York was very much in the cards throughout much of the Colonial Period, but for such to succeed the French needed intelligence. For this this they turned to the French privateer John Reaux, who was naturalized as a citizen of New York in 1692. No sooner had Reaux become a New Yorker than he attempted to capture a ship and seize its contents - several thousand pounds sterling! Reaux fled to France to avoid imprisonment and there, according to his own confession, he was interrogated by naval authorities regarding the feasibility of an attack on New York. It is from this interrogation that the original Franquelin plan of New York may most likely have been composed. Reaux must have had stronger loyalties to New York than his criminal behavior may suggest - for he advocated convincingly against the very kind of naval invasion that would most likely been successful. Reaux, Franquelin, and ultimately Bellin's New York is a veritable european style citadel surrounded on all sides by heavy fortifications, sheer cliffs, cannon batteries, a nearly inaccessible harbor, and a difficult to navigate entrance. The city thus depicted is far more heavily fortified than we known it to have been at the time - or at any point in its history. While there is no proof that this plan dissuaded the French from their military ambitions, the fact that no invasion followed suggests it may have played a role. Bellin of course, published this plan nearly seventy years after the Franquelin plan. Upon initial consideration it seems shocking that no subsequent maps of New York City had become available. There were in fact several superior plans of New York, however, these were closely guarded British secrets and would not have been available to the French Hydrographer General. 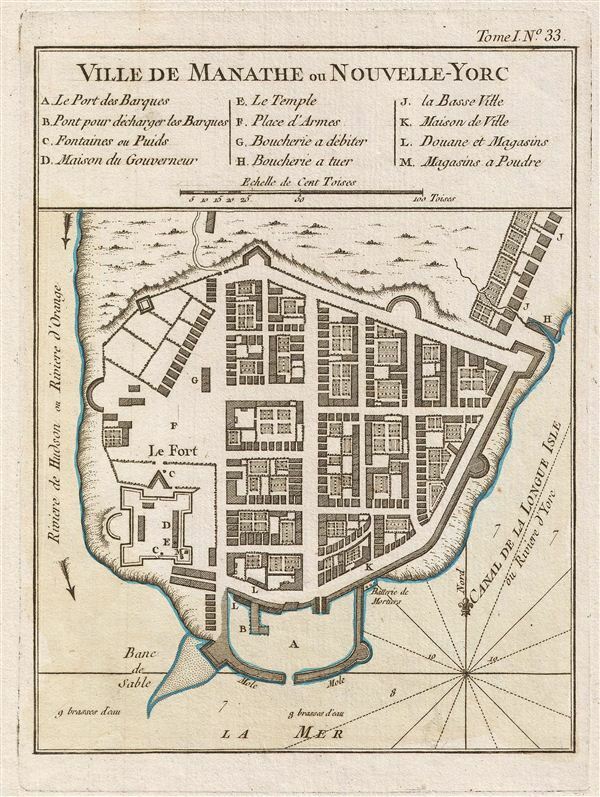 This map was first published in the 1763 edition of Bellin's Petit Atlas Francois and subsequently reissued one year later in the 1764 Petit Atlas Maritime. The present example represents the second publication, identifiable by the 'Tome I, No. 33' notation along the upper right border. Both atlases were subject to large print runs and proved popular - making this the earliest obtainable map of New York City. Bellin, J. N., Petite Atlas Maritime, Vol. 1, (Paris) 1764. Bellin's Petit Atlas Maritime was a five volume atlas of all parts of the world published in Paris in 1764. The atlas is a combination of fresh material and previous issued Bellin maps. The breakdown of volumes is as follows: Volume I: North America and the Caribbean (102 Maps), Volume II: South America (89 maps), Volume III: Asia and Africa (127 maps), Volume IV: Europe (130 maps), and Volume V: France (132 maps), for a total of 580 maps and plans. This important atlas marked a major transition in European nautical mapping. It's significance is most accentuated by comparison to Bellin's other great atlas, L’Hydrographie Française, a large format work much akin to Dutch nautical atlases of the previous century. The Petit Atlas Maritime, on the other hand, was issued in a more compact format that allow for a diverse wealth of individual maps. Stylistically, it had more in common with European road atlases than with other nautical atlases of the period. As the largest collection of plans of harbors and nautical maps available at the time of publication, the Petite Atlas Maritime work proved popular with navigators and armchair adventurers alike. Its universal appeal gave rise to new convention in maritime mapping. The atlas was sponsored by the Duc de Choiseul. J. Arrivet is listed as engraver on the chart index pages, but there is a great likelihood he also engraved the maps and plans. Very good condition. Original platemark visible. Blank on verso. Augustyn, R. T., Cohen, P., Manhattan in Maps 1527 - 1995, p. 50-51. Haskell, D., Manhattan Maps A Co-operative List, nos. 296-302.